Everything you want, all to yourselves… Oceanfront location. Spectacular St. Martin views. Footpath to small sand beach. Huge pool & jacuzzi. 5 bedrooms with ensuite baths. AC & WIFI. Impeccable service. Located on the safe and tranquil British Caribbean island of Anguilla, oceanfront Beaches Edge Anguilla Villa is “where to go” for a relaxing Caribbean beach getaway, fun-filled family vacation or dream Anguilla destination wedding. Add the villa next door to Beaches Edge for a total of 10 bedrooms and twice the villa amenities. Our housekeeper visits daily. Our on-island concierge will help you plan your trip, can arrange car rentals, excursions and activities, greets you at the villa, and is always on-call. Customize your vacation and treat yourself with optional private chef, in-villa massages, grocery stocking, childcare and destination wedding services. Beaches Edge is near Anguilla’s desirable West End and minutes from Anguilla’s most beautiful beaches, award-winning restaurants and the CuisinArt Golf Resort & Spa. There are plenty of things to do on Anguilla for all ages and several options for getting to the island. We are happy to report Hurricane Irma is now in the past. Most airlines and boats are back in service, island restaurants and businesses are open, the beaches are beautiful, the rum punch is iced and ready to drink, and Beaches Edge Villa is in pristine condition and actively hosting guests! We had a wonderful stay at Beaches Edge! Michelle and Lillian were fantastic. The home is modern and clean and the new pool one of the largest I've seen in the Caribbean. Concierge services were very helpful too in both arranging transport to and from Sint Maarten, as well as getting 2 jeeps for the week. Couldn't be happier with choosing this villa. The size of the villas, as well as their side-by-side set-up, made it perfect for our family and friends who joined us. In the early planning stages, the friendliness of everyone I spoke to, along with the pictures and reviews, made it clear that Beaches Edge was just what we were looking for. My husband and I stayed here with our 3 small children and extended family (10 people total) and had an amazing time. The pictures do not lie--the house is really that beautiful. Having small children, it's incredibly convenient to have the kiddie pool, main pool (which is pretty shallow/safe for kids) and hot tub right there outside the glass doors so you can just step right out and into the water. The kitchen is well-stocked and there wasn't anything we needed that we couldn't find. The house also had plenty of beach towels, which with a group our size we needed. And the quality of the beach towels, bath linens and bed linens was very good (small criticism: shampoo/conditioner/soap could have been better). The service we received from the villa managers Michelle and Barbara was wonderful as well. They really made sure everything was taken care of, and helped arrange our boat transfers, car rentals, crib/baby item rentals, and restaurant reservations before we arrived. They also helped to arrange for a private chef (Chef Shermon--who is AMAZING) to come to the villa to make our group dinner a couple of evenings and breakfast every other day. The housekeeper, Lilian, was also very good and even did our laundry for us. We really loved the house and enjoyed our stay very much. My family stayed at Beaches Edge for my wedding. This location is just amazing. The photos do not begin to describe how beautiful the location really is. The ocean is breathtaking, the rooms are well appointed and the living room/kitchen well stocked. In addition to the villas having all you need; the location is really convenient. It is very close to the ferry and meads bay but also privately located so you feel like you are on the island by yourself. What sets the villas apart is the excellent service provided by the villa manager Michelle Owens. Everything that we needed was attended to. Staying at Beaches Edge made our special time a cherished memory. 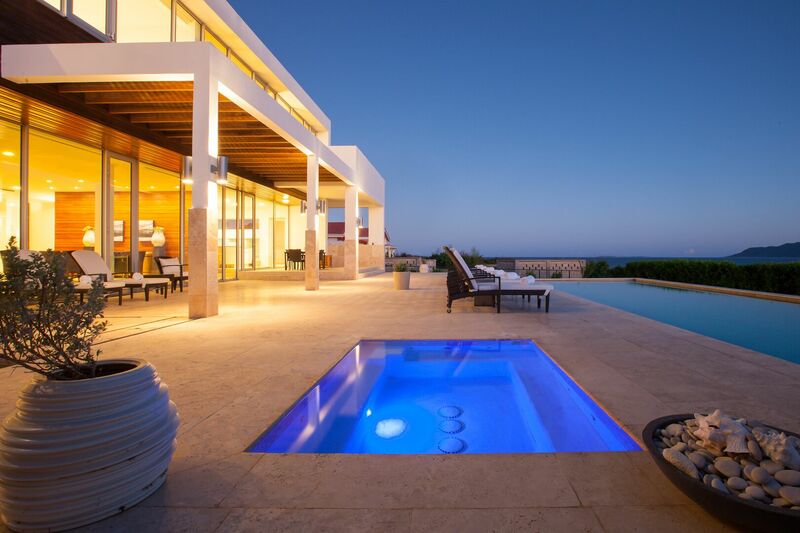 I would HIGHLY recommend booking the villas for your stay in Anguilla. We had our wedding at Beaches Edge Villas and our family stayed at the villa during our stay. We had the most amazing time and experience. The service was absolutely excellent. All of our questions were attended to and we were referred to great vendors for our wedding needs. Our wedding turned out like a dream. I would highly recommend this location for anyone considering a destination wedding! My boyfriend & I stayed at Beaches Edge villa for a week with another couple this past April. Neil, Christina, & Michelle all of their team was beyond accommodating and helpful before, during and after our stay. The service was 5-star and this home was our favorite part of the trip (outside of the clear, glassy water beaches). 🙂 The view at night from the bedrooms are breathtaking and it's like your own little resort. The owners did a fabulous job to create a luxurious property for many to enjoy, I highly recommend Beaches Edge! Thanks so much for making our 1st time to Anguilla so unforgettable. Our recent stay at Beaches Edge was nothing short of spectacular! We went with 2 other couples to Anguilla. The pictures of the house truly represent the experience. The housekeepers were amazing. Sheets and towels are top of the line. The views cannot be beat! The house is only a few minutes from the ferry transport to St. Maarten. The beaches in Anguilla are like silk...the water crystal clear blue. The owner checked in on us during the week, along with the Concierge. We had a first class experience at Beaches Edge! Thank you. Beaches Edge is a wonderful place to stay. I definitely give it 5 stars. We couldn't have been more pleased with the villas, the staff and Anguilla. I am on the board of a commercial real estate group in Chicago and we chose Beaches Edge as the location for our annual planning retreat this past February. We had 10 people so we booked both the East and West villas so everyone had his own bedroom suite and private bathroom. It was a working vacation for all of us, so the fact that the villas had Internet access was key. It worked out perfectly. With two villas we had plenty of space to spread out and then we met back up for meals and meetings. The owner and staff helped us plan our trip down to the last detail and everything was in pristine shape on the property. We flew into St. Martin. Some of my colleagues came in a day early and spent a night in St. Martin. We all made the quick trip by boat (I was actually surprised how close the boat launch was to the airport) to Anguilla and then took a taxi to Beaches Edge. The view is truly astounding. The villas are 5-star and secluded. We had a driver we could call anytime we wanted to go anywhere, and everything is just a few minutes away. There's a path next to the villas that takes you down to the beach. We walked down several times and took lots of great pictures. I was particularly struck by the beauty of the shadow of the mountains on St. Martin against the light blue of the sky and the deeper blue of the ocean. We spent hours out on the terrace, in the hot tub and pool just enjoying the view. We didn't cook anything except make coffee, but the kitchen had everything and there was a grill too. The food on Anguilla is delicious, really fresh and well-prepared. The villas' owner arranged for Dale Carty, the head chef and owner of Tasty's to come over and cook for us one night. It was one of the best meals we've ever had and included fresh grilled fish and some amazing Brussel sprouts. The restaurant Picante was also one of my favorites. We were just there for four days, so we didn't have long enough to explore the whole island, but we did a little beach hopping, snorkeling and swimming, took a boat cruise to one of the cays, listened to reggae legend Bankie Banks perform at his bar, Dune Preserve, and jumped off the rock at Little Bay. Some of my colleagues also went fishing. My wife was jealous that I got to go and she didn't, and we are already planning a family trip back with our kids. I highly recommend Beaches Edge. I had the pleasure of staying at Beaches Edge Anguilla (East Villa) with my husband. Once we first entered into the villa our breath was taken away instantly! We truly felt we were in our dream home away from home! It was honestly the cherry on top after entering into Anguilla! 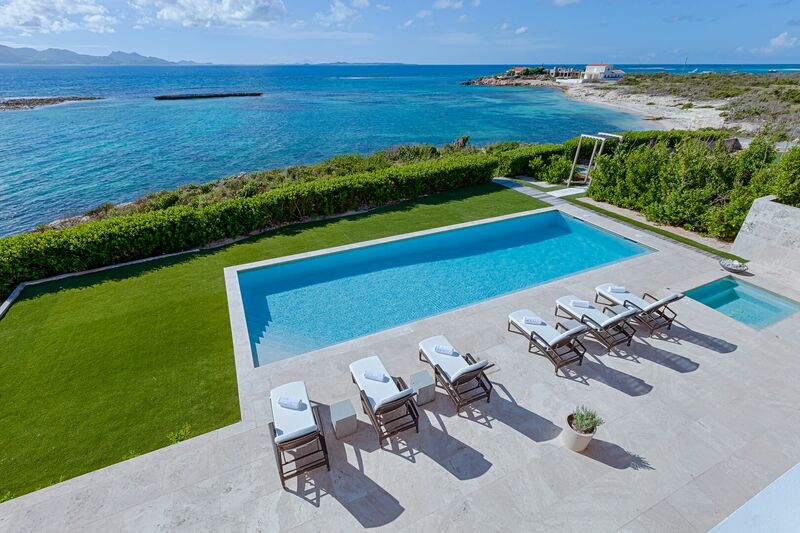 The view of St. Martin from the villa during the day and night is absolutely stunning! The staff are extremely friendly and helpful! Especially Michelle! She made sure everything was taken care of before we even had to ask! Beaches Edge Anguilla is perfect for a honeymoon, vacation, family reunion, destination weddings, rehearsal dinners, YOU NAME IT! I would absolutely recommend Beaches Edge to a friend, family member, or ANY perspective guests! Thank you so much for having us!!" Words truly cannot describe our stay at Beaches Edge Anguilla. But I will try...From the serene private setting with amazing views of the ocean to the full service staff (which you would never even know they were there because they were so discreet), there is nothing not to love about the Villas. In addition to the beauty of the villa itself, the name recognition that comes with it which allows for preferred service as you explore the island, is the icing on the cake! Cannot wait to visit again! Truly one of my favorite places! I found the most peaceful place on earth!"